This is going to be short, since I don't think I'm ever going to digest what I just saw. The first Park Chan-wook film I saw was Stoker, and I loved that very much so I decided to stop putting off watching some of his Korean films from my watch list. I decided to go with Oldboy, which is the second film in the Vengeance trilogy (I don't think there's a need to watch the films in chronological order, but I might be wrong) because it was his most popular one, or at least the one I keep hearing of. It is about a man who seeks revenge to his captor after imprisoning him for 15 years. I knew the twist in the film beforehand, but I didn't realize how disturbing the entire ordeal was until I saw the film. The performances of Choi Min-sik, Kang Hye-jeong, and Yu Ji-tae were amazing, but the film rested on Choi Min-sik's hands. His performance at the end was so heartbreaking, and after seeing everything else that went on before his final scene with Yu Ji-tae, it was very hard to watch. The man was built for this role; the craziness of his actions from his octopus eating scene to beating the hell out of everybody, he gave a fantastic performance. Yu Ji-tae's character was sick and evil, and he gave a complimentary performance in his final scenes. Kim Byeong-ok was also a memorable character, even if he was mainly standing around being Yu Ji-tae's henchman. There was some fine filmmaking going on here. The corridor fight scene that was done in one take was amazing. The reveal of what Oh Dae-su was supposed to figure out was done well, as well as the plot twist to this thriller. With everything that went on in this film, I think this is one of those films that I can only watch once. I didn't expect this film to be that disturbing, and yet it was clever. This is my entry in this year's Blind Spot Series hosted by Returning Videotapes. Click the banner for my other entries. 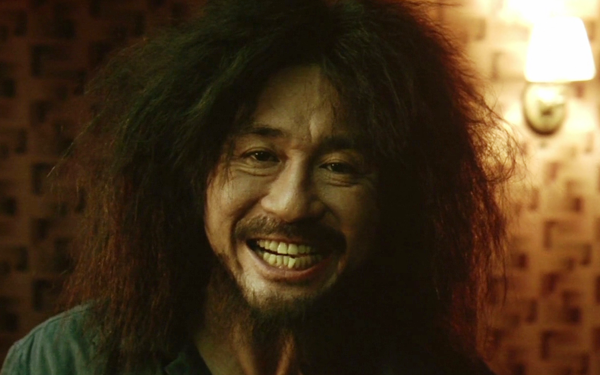 Having seen several of Chan-wook Park's films, Oldboy is often the best place to start. As for the rest of the trilogy, there's no need to watch them in chronological order since it's essentially a thematic trilogy. If you liked this and Stoker, I'd totally recommend the rest of the trilogy plus Thirst and The Handmaiden. I'd also check out JSA: Joint Security Area and I'm a Cyborg but That's OK. I'm going to try and watch more of his films, I just have to figure out what to watch next. I'm leaning towards I'm a Cyborg because it doesn't seem as intense as the others. You're probably right. You may never digest what you just watched. I first saw this more than a decade ago, have watched it several times since, and it still bugs the hell out of me. It's one of my all-time faves because of this. You're also right there is no reason to watch this trilogy in chronological order since they are unrelated, except by theme. I hope you give the other two a try. The rest of the trilogy will definitely be on my watch list. I'm curious to know as to why this is the most popular of the three. I was expecting the twist, but with everything that happened, that was one disturbing turn of events. This was my first Blind Spot ever!! I loved it a lot, but it's a lot to digest in one viewing, yeah.